The Best Sign Language blogs from thousands of top Sign Language blogs in our index using search and social metrics. Data will be refreshed once a week. Sign Language newsletter is a comprehensive summary of the day's most important blog posts and news articles from the best Sign Language websites on the web, and delivered to your email inbox each morning. To subscribe, simply provide us with your email address. Chicago, IL, United States About Blog Hi, I'm Libbey and I do Sign Language to music. Facebook fans n/a. Twitter followers 4,383. London, United Kingdom About Blog London’s Global University: a diverse intellectual community, engaged with the wider world and committed to changing it for the better; recognised for our radical and critical thinking and its widespread influence; with an outstanding ability to integrate our education, research, innovation and enterprise for the long-term benefit of humanity. Facebook fans 168,488. Twitter followers 35,227. Irvine, CA, United States About Blog We've been high school sweet hearts since 2011 and Ryan who is Deaf has been teaching me, Ellen who is hearing Sign Language ever since. We hope to share some signs and show you all that Deaf and Hearing relationships are wonderful! Tucker, Georgia, Chicago, Houston, Atlanta, Los An About Blog A true partner in education, ProCare is one of the country’s top sources of school jobs and staffing. We are here to be an asset to the children we serve, a partner to the schools we partner with and a resource for talented school professionals. Facebook fans 4,681. Twitter followers 161. Marietta, GA About Blog StreetLeverage spotlights practitioners & industry stakeholders rethinking the way we understand, practice, & tell the story of the sign language interpreter. StreetLeverage is committed to the belief that it is often the most obvious and important realities that are the hardest to see and talk about. Facebook fans 9,479. Twitter followers 3,886. New York City About Blog Offering professional Sign Language interpreting services in all 5 boroughs of NYC, Long Island, Westchester county, and New Jersey. Culturally competent communication access. LC Interpreting Service provides high quality interpreting services in American Sign Language, Spanish Sign Language, and International Sign. Facebook fans 780. Twitter followers 3,457. England, United Kingdom About Blog Signly is an app which displays pre-recorded sign language videos on a user's mobile, enabling better access to written content for d/Deaf sign language users. Facebook fans 382. Twitter followers 438. Johannesburg, South Africa About Blog DTV is South Africa's only magazine style TV show produced for the Deaf by the Deaf. The TV programme is designed not only to entertain, but also empower the Deaf, while promoting deaf awareness among the hearing. Each episode of DTV features a combination of profiles on local celebrities and inspiring individuals, news and information relevant to the Deaf community & South African Sign Language. Facebook fans 5,400. Twitter followers 839. Zeeland, MI About Blog We believe God has called DOOR International to reach the Deaf for Christ through translation, training, and partnerships. Bringing God's Word and Biblical Christian Fellowship to Deaf Communities Worldwide. Facebook fans 2,993. Twitter followers 220. Plainville, MA, New England. Northeast U.S.A. About Blog Read up on the latest news from one of the top interpreting agencies in New England. Our ASL interpreting services blog has great updates on events and trends! Our Massachusetts interpreters will provide you with top tier service for all your ASL interpreting needs. We also offer captioning, VRI, and more. Facebook fans 737. Twitter followers 581. London, England About Blog Wayne Barrow is a TV Presenter and also a Radio Presenter. Starting his career in radio, he's developed a passion for also working in television. Working his way up the career ladder, he also also shared his love of British Sign Language by using music videos to interpret the music. Facebook fans 51,136. Twitter followers 3,739. Colorado, Denver, Brighton, Castle Rock, Colorado About Blog Rose is a local interpreting service specializing in the communication needs of the deaf and hard of hearing community in Denver, Colorado and surrounding areas. We are proud to be 100% veteran and woman owned. Facebook fans 1,716. Twitter followers 361. Grand Rapids, Michigan About Blog The mission of this blog is to serve as a voice of a constant researcher in the field of educational and assistive technologies so that the best products, strategies and services may be located easily, in hopes that they will then be delivered, taught and used to better the lives of people with disabilities. Facebook fans 574. Twitter followers 313. Montpelier, Vermont About Blog Stay up-to-date with everything happening a Nine East Network. News, blogs, and job openigns! Nine East Network is connects children, families, and schools with effective strategies to address language delays and hearing loss. Antwerp, Belgium About Blog This is a personal blog. Depending on the topic, Maartje de Meulder writes in English or Dutch (her native language). Maartje de Meulder's broader research interests cover the legal recognition of sign languages, sign language policy and planning, multilingualism, family language policy, deaf communities’ political participation and the UNCRPD. Monterey, CA About Blog Sign language tutoring and interpreting articles by Chelsea Hull, founder of Chelsea's Busy Hands. Learn about my teaching techniques and more. Chelsea brings over ten years of sign language expertise. Facebook fans n/a. Twitter followers 27. 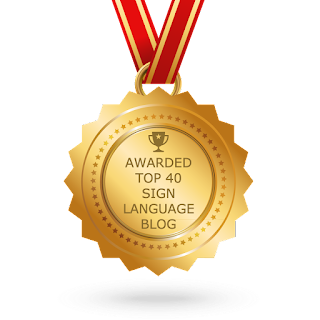 CONGRATULATIONS to every blogger that has made this Top Sign Language Blogs list! This is the most comprehensive list of best Sign Language blogs on the internet and I’m honoured to have you as part of this! I personally give you a high-five and want to thank you for your contribution to this world.